The Feed Zone series includes three cookbooks and more than 325 athlete-friendly recipes that are quick to prepare and taste delicious. You can see all the Feed Zone sample recipes available on this site, which are just a few of the 150 athlete-friendly recipes in The Feed Zone Cookbook, 75 portable recipes in Feed Zone Portables, and 100 family-style dinners in the new Feed Zone Table. 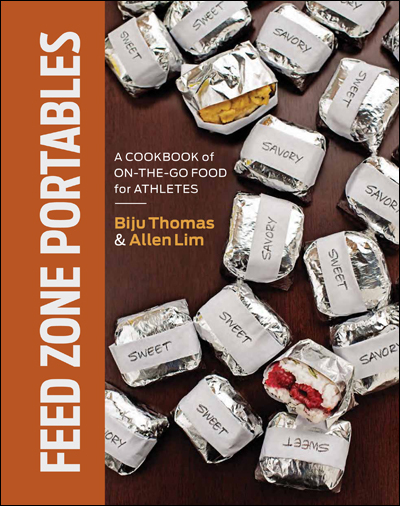 The Feed Zone Cookbook offers 150 athlete-friendly recipes including breakfasts, lunches, dinners, snacks, post-workout recovery meals, beverages, desserts, and a few of the first popular portable snacks. The cookbook includes more than 100 gluten-free and 100 vegetarian recipes. Check out free sample recipes from The Feed Zone Cookbook here. Feed Zone Portables offers 75 all-new portable snack recipes that taste delicious during exercise including Rice Cakes, Two-Bite Pies, Griddle Cakes, Waffles, Baked Eggs, Sticky Bites, Rice Balls, Ride Sandwiches, Baked Cakes, and Cookies. The cookbook includes 50 gluten-free and 50 vegetarian recipes. Check out some free sample recipes for Feed Zone Portables here. Feed Zone Table offers more than 100 all-new recipes to inspire your family-style dinners and bring friends and family to the table in a way that nourishes life and sport. Here’s the list of free sample recipes from Feed Zone Table. To see samples from more than 100 vegetarian or gluten-free Feed Zone recipes, check out this post or look for the tags “gluten-free Feed Zone recipes” or “vegetarian Feed Zone recipes” on this website. Find The Feed Zone Series in your local bookstore; bike, tri, or running shop; or online from the publisher VeloPress, Skratch Labs, Amazon, Barnes & Noble, Chapters/Indigo, TriSports.com, your local independent bookseller, Apple’s iBookstore for iPad.